Last week in Part 2 we looked at gaining planning approval, having earthworks done and laying the concrete slab. 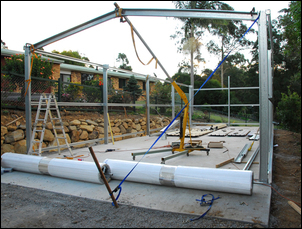 The materials for the 14 x 6 x 3 metre workshop had been delivered – and it was time for erection. I’d originally planned (and budgeted) for the shed supply company to erect the workshop, but when time came to book in the work, I was told there’d be a delay of at least 2 months. Not wanting to wait that long, I decided to build it myself. 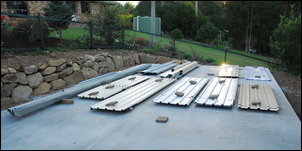 The shed supply company supplied a booklet of instructions – interestedly, it was much the same as the one downloadable from http://aussiesheds.net.au/Building%20instructions.pdf. These instructions look quite comprehensive but in fact – at least for a shed building novice – they have numerous inadequacies. 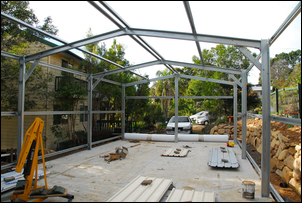 As just one example, no dimensions are included in the instructions – they’re said to suit any shed from 3 to 30 metre span! Making things a little easier in that regard were the engineering plans for my specific shed (and these include dimensions) but there are still plenty of points that fall into the gap between the instructions and the engineering plans. In addition to the instruction booklet, a man from the shed company also talked me through some of the build process. This occurred when the delivery of the roller doors and fasteners were made. Because the bloke could physically walk around the site, using the actual build materials in his examples, I found the oral instructions much more useful than the written instructions. However, while he left me his card and said I could call him if I had any problems, I subsequently found his ability to give instructions over the phone was at times poor. The shed building vocabulary also takes some getting used to – if you can’t quickly learn what girts, purlins, rafters, mullions, haunch plates, knee braces and cleats are, you’ll be sunk. There are two basic ways of erecting a shed. 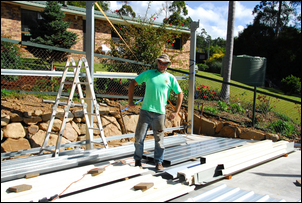 The first is to assemble the wall frames flat on the ground, attaching the sheet cladding while the wall is still flat. The wall is then lifted into position and the columns bolted to the concrete pad. The rafter assemblies are placed in position between the columns, the longitudinal purlins added and the roof cladding screwed into place. However, this approach is not advisable when the shed is longer than 12 metres, or in windy conditions. The other approach is to assemble the portals (a portal comprises an assembly of two columns and two rafters – a bit like an inverted U frame) on the ground and then lift these into place. The longitudinal side wall girts are then placed into position, followed by the roof-top purlins. The shed is then clad. However, because I was singlehandedly erecting the shed, the shed company suggested that I do things yet another way. I was to erect the bare columns first and then attach the longitudinal side wall girts. With the wall framework complete, I could then lift into place the A-shaped rafter assemblies and proceed from there. The 3-metre long C-section columns can be reasonably easily lifted by a single person – in fact they’re light enough that they can be stood in position and have their bracket hole positions marked on the concrete floor. But where do the columns go? You’d think that they go along the edge of the slab - but that ain’t so. Instead, they’re located 65mm in from the edge, so that when the ‘top-hat’ girts (longitudinal side wall supports) are placed in position, the cladding wraps over the edge of the concrete slab. 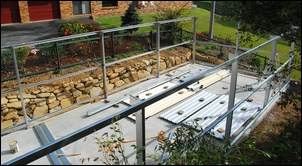 I installed each of the five columns of one wall, dyna-bolting their mounting brackets to the concrete pad. Without any side loads placed on them, they stood by themselves. I installed the lower longitudinal girt, initially g-clamping it into place. The columns then needed to be squared-up, something most easily achieved by using a tape measure to ensure that the diagonals of each bay were the same length. When the bays weren’t square, it was easy to use ratchet tie-down straps to distort the assemblies until they were correct. A long bubble level was also used to further ensure verticality. The girts and eave purlins were screwed to the columns with tek screws. Again, these members were easily able to be lifted and positioned by a single person, helped with g-clamps and vice-grips to hold the pieces in position as they were screwed. 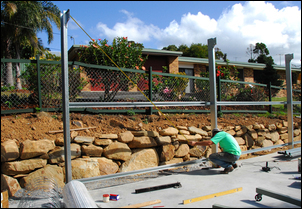 Once one wall frame was done, the other was completed and then the back wall frame erected. It took about 1.5 days to erect the three wall frames. When I inspected the shed design at the display, I was not impressed with how tek screws were used to hold the framework together. And that was the whole framework – columns, rafters – the lot! That lot added up to something like 150 12mm holes! Furthermore, the problems I had with the errection of the frame could all be sheeted-home to the positions of these holes. The rafter assemblies were drilled and bolted together on the ground. Care was taken that all the assemblies were the same – the apex attachment plates are shaped so that the rafters nestle into position, but there is sufficient slop that the actual roof pitch angle can end up varying a lot. So I made one rafter assembly, taking care that the width of the assembly matched the width between the columns, and then made the others to match it. The next step was a major one – how to lift the rafter assemblies into place? They were way too heavy for one person to do this – especially as at the same time the person had to drill holes and insert and tighten bolts! I got out my trusty hydraulic engine crane, removed the short extension jib and instead slid in a 3 metre length of 50 x 50 x 3mm square tube. I added heavy weights to the base of the crane and then positioned the new, extended jib horizontally – the angle at which bending and overturning forces are greatest. Set up in this way I found the crane could support my full weight applied at the end of the jib – so there shouldn’t be any problems lifting the rafter assemblies. And there weren’t! The rafter assemblies were easily lifted into position, temporarily G-clamped to the haunch plates and then – after the columns were checked for verticality – drilled and bolted into place. It wasn’t long before I had three of the five rafter assemblies mounted – time to install the first half of the longitudinal purlins. But I ran into a major difficulty, one that took me hours to solve. The bare rafter assembly A-frames are quite floppy, so when erected and bolted into place, they don’t necessarily lie on a vertical plane. But obviously they need to be vertical before the purlins are screwed into place, so I used clamps and vice-grips to connect the first purlin to the three A-frames while I straightened them. But how to tell when the A-frames are straight? It would seem easy – drop a plumb-bob down to the ground and the apex should lie on the same plane as a line joining the base of the columns. But my step ladder was pushed for height (and the floppy A-frame meant I couldn’t extend the ladder and rest it against them!) so getting the plumb-bob up high enough was difficult – not to mention even a breath of wind moved the line away from vertical. OK then, what about temporarily holding a mullion (the long end-wall column) up against the A-frame and using the bubble level? Fine, except because of its extra length, the mullion is getting pretty heavy to hold in this way – especially when it needs to be done many times after small adjustments to the A-frames are made. Then I found that, even with the purlin clamped to three A-frames, the whole lot would flop back and forth! Aaaggh! I took a step back (literally – I walked away and looked afresh at the problem) and then adopted the following strategy that worked perfectly. 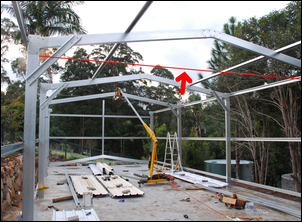 Firstly, I placed string lines between the columns, as high up as possible and directly under the A-frames (one string line is highlighted here in red). Using the high string line, it was easy to line up by eye the A-frame against the string, so detecting misalignments of only a few millimetres. I then got the first A-frame straight and using two ratchet tie-down straps, guyed it into place. With that assembly held firmly in the correct position, the rest could be lined up and then clamped. Easy after it’s said and done! 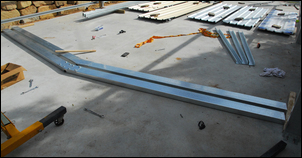 The remaining purlins were then placed into position and tek-screwed into place. Despite the height of the shed (3 metre wall), I found I could position these roof members using just a normal 1.8 metre tall ladder of the sort that can be used as step ladder or unfolded to become a long ladder. 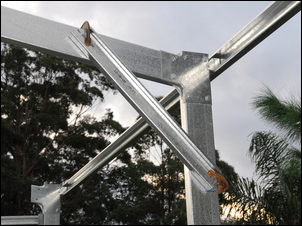 The purlins were light enough to be lifted into position by hand before being clamped into place and then tek-screwed. The final part of the frame construction was to place the front wall vertical column (central mullion) into place and then install the two lintels above where the roller doors will be positioned. Once again, the provided instructions for both of these procedures were poor; because of this, it probably cost me two hours of wasted time. The more G-clamps and vice-grips you have available, the better. Since many holes need to be drilled while up a ladder, keep drill-bits sharp. Use a long bubble level and tape measure to check bays for squareness. Don’t be afraid to pull and push the framework this way or that to get columns vertical and edges square. Ratchet straps attached to stakes are a good way of achieving this. Be aware that not even a well laid concrete slab is likely to be perfectly square in plan. A whiteboard marker makes lines that wipe off easily after they’re no longer needed. Use templates and gauges when performing repetitive tasks, eg when making sets of identical rafter assemblies.